In a pantry filled with olive oils from Italy, Spain, California and Trader Joe's, there's bound to be a vinegar or two. Or more. Welcome to Vinegar Week, Day 1. Updated October 2011. Before Marc Antony fell on his sword, he fell in love with Cleopatra, and she, though married to Caesar at the time, loved him right back. One night, Cleopatra prepared a very over-the-top meal for Antony, who should have been impressed, but instead had the bad manners to comment on the extravagance. Piqued, Cleopatra wagered that she could consume a fortune in one meal. She then removed one of the very large pearls in her earrings and threw it into a cup of vinegar. The vinegar dissolved the pearl, and she drank it. I like my vinegar a bit more moderate: strong enough to balance the effects of a rich olive oil, but mild enough not to dissolve my jewelry. vinegar is made by two distinct biological processes, both the result of the action of harmless microorganisms (yeast and “Acetobacter”) that turn sugars (carbohydrates) into acetic acid. The first process is called alcoholic fermentation and occurs when yeasts change natural sugars to alcohol under controlled conditions. In the second process, a group of bacteria (called “Acetobacter”) converts the alcohol portion to acid. This is the acetic, or acid fermentation, that forms vinegar. Proper bacteria cultures are important; timing is important; and fermentation should be carefully controlled. 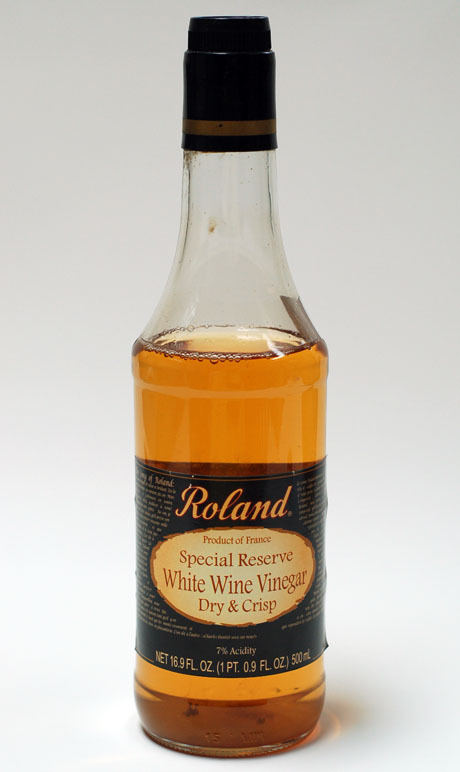 White wine vinegar can vary in color from white to pale gold, with an acid content of 5-7 percent. Like most vinegars, it's a self-preservative that will keep almost indefinitely on the pantry shelf. From the pantry, you'll need: extra virgin olive oil, onion, canned tomatoes, black olives, capers, white wine vinegar, granulated sugar, pine nuts. Adapted from Diane Seed's Top 100 Mediterranean Dishes, this flavorful sweet-sour Sicilian condiment can be served as a dip with pita triangles, or a topping to grilled swordfish or salmon. Serves 6. Dice the eggplant and place the cubes in a colander. Sprinkle with salt, and set aside for an hour. Heat half of the oil in a large sauté pan, and cook the celery for approximately 15 minutes over low heat before adding the onion. When the onion is soft and beginning to change color, remove the vegetables with a slotted spoon, and add the remaining oil to the pan. Turn the heat to medium-high, and add the eggplant. Cook for 10 minutes, stirring continuously. Add the tomatoes, olives and capers, and the vinegar, sugar, and a bit of pepper. Return celery and onions to the pan. Reduce heat to simmer, and cook for 15 minutes or until the mixture has thickened. While the caponata is simmering, toast the pine nuts in a dry frying pan for 2-3 minutes, until just lightly browned. When the caponata has thickened, stir in the pine nuts and basil. Remove pan from heat. Allow to cool, and serve cold or at room temperature. I use sherry vinegar a lot, and white balsamic, my newest find. Love the caponato - a summer replacement for the ever-present Spanish escalivada... but with more flavor! You won't believe this, but just this morning I was thinking - how do they make vinegar? Now I know! Katie, I was surprised at how many vinegars I had in the pantry -- I love white balsamic, too. Michele, welcome to The Perfect Pantry! That must have been some strong vinegar! I keep telling myself I need a bottle of white wine vinegar. I'm looking forward to the rest of vinegar week! Man instead of thinking of her puddled jewels, I keep thinking of Cleopatra's stomach of steel- those men didn't have a chance with the likes of her! I too look forward to learning more. Hooray for vinegar week! Can't wait. oh wow, I did not know that vinegar can dissolve jewelry, Cleopatra must have been royally miffed! This caponata definitely sounds good with seafood! Callipygia, Cleopatra was a force, and not just because she could eat pearls! Veron, about the dissolving jewelry thing, you know what they say: "don't try this at home!" I love caponata on grilled swordfish or tuna; the vinegar helps cut the richness of the fish. I am waiting for more posts on vinegar Lydia! Love love them! "Dice the eggplant and place the cubes in a colander. Sprinkle with salt, and set aside for an hour." What purpose, chemically or functionally, does this step serve, I wonder? Does anyone know? Again, blessed by location. Zingerman's stocks a variety of fabulous Vinegars, including a 6,8 and 10 year balsamic bottled in Modena. Not counting balsamic, my favorite, by far, is Cider vinegar. It's neat in soups (beet, veggie, etc) and I recently tossed some at the end of a bacon sautéed head of cabbage dish. It worked well! Added a tad bit of fruity bite. Looking forward to more vinegar recipes ;) I might have to try that caponata just to see what salting eggplant does! Anh, there's more to come later this week! I make my own vinegar and have for years. I bet it was 18 years ago that my friend gave me a jar of her vinegar mother. That mother still lives in a plastic jug in my cabinet and I feed it red wine whenever I have a bit extra. I've made champagne vinegar and blueberry vinegar but I find that I'm actually quite satisfied to have three: red wine, apple cider, and balsamic. But of course I always have a gallon of white vinegar in the house...it has so many uses that I just can't be without it. Vanessa, that's amazing -- will vinegar must live forever, like a sourdough starter, as long as it's fed? I learn all sorts of interesting things from Pantry readers! i love the cleopatra story! i must admit that i steer away from vinegar (i'm not sure why). i bought some balsamic vinegar months ago & have yet to even open it! so i look forward to your vinegar week. I really like the sound of this dip. Certainly I have more than two vinegars in my pantry. . . . I really enjoy vinegar. Candy, vinegar really is the perfect balance to rich or fatty foods (like fish), and a good sweet vinegar helps perk up a salad, too. There are so many vinegars available; I hope you'll find one you like! Thanks for visiting The Perfect Pantry. Tanna, when I started to count all of the vinegars....oh, boy, was I surprised at how many I have! I am a closet vinegar drinker. And collector. I have many, many, many and I love them all (scary, huh?) Just got a new one for my birthday that I am going to post on soon. Can't wait for the rest of Vinegar Week! Christine, now you've made me curious. A new vinegar? Please let us know when you post about it! I was wondering if anyone has had any experience making vinegar from dessert wine? I read about some delicious sounding vinegars - one made in California from Late Harvest Sauvignon Blanc grapes and one made in Austia from Pedro Ximenez Dessert Sherry. I was wondering if it was possible to do the same thing at home. Afterthefall, welcome to The Perfect Pantry. This is such an interesting question. I've never tried to make vinegar from dessert wine. Pantry readers, any input or advice?